1. This could be one of the best suprises of 2000, at least quarter-scale modellers - released this week in Russia is a 1:48 scale resin Mil Mi-8 'Hip', from a producer called 'Navigator' who are based in Nizhni Novgorod and are affiliated with a company that actually produces 1:1 scale Mi-8's and Mi-17's there. This kit was due to come out last year but was delayed by lack of resin compound (a problem solved by Linden Hill Imports). I believe it will be several weeks before this kit is actually ready to ship, the clear parts not being ready yet, but it will be available from Tushino Aviapress in Russia (for $40) and from Linden Hill in the USA (for $45). Linden Hill will post some in-box photos at their site as soon as their shipment arrives. 2. 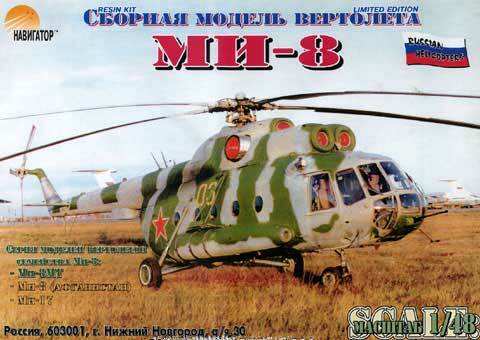 Another big suprise from Russia is that Zvezda have launched a 1:72 kit of a Kamov Ka-58 'Black Ghost', #7232. Never heard of a Ka-58? Perhaps the answer comes in the small-print down the left side of the box, where you will find the words 'syerya nyeizvyestnay Kamov', which roughly translates into 'imaginary Kamov series'. The box contains parts for two versions, an attack helicopter and a scout, totalling 110 parts in light grey plastic with good engraved panel lines, air intakes, and rivets, plus 4 clear parts which are better quality than is normal in Russian and Ukranian kits. The small decal sheet is from Zvezda/Travers, and carries 2 red stars, 2 Russian flags, and 2 BuNo 06-white. The attack version is equipped with a twin barrel cannon, stub wings and weapons bays after the style of the RAH-66 Comanche, plus a selection of missiles and rocket pods. It's anyone's guess why Zvezda have released this kit ahead of their long awaited 1:72 Mi-8 (and MiG-31), but there's a strong possibility that sponsorship from Kamov may have had something to do with it. 3. Now for some less than positive news about the InTECH Mi-2 kits which were released last week in three different versions. To quote from our Poland correspondent "The only way to have satisfaction from it is to throw it to the litter box. All dimensions are wrong; panel lines, windows and doors have the wrong shape, but the main problem is the incorrect shape of the engine cover". 4. Also at Jadar is the news that PART will soon release a new etched-brass set for the Mi-2 which will also be applicable to the Amodel and AeroTeam kits. 5. The Eduard canopy mask set for the Hasegawa AH-1S Cobra is now available, #XS027. An MH-53J at Mildenhall Airshow. A selection of New Zealand rescue helicopters. A Lynx Mk.86 operated for the Norwegian Coastguard by 337 Skv. of the RNoAF at Bardufoss. RAF 22 Sqn. SAR helicopters at RAF Valley. Classic Rotors - rare and vintage helicopters (including the H-21 from the movie Godzilla). Aviones Argentinos, including a comprehensive selection of Argentine helicopters, military and civil. 7. Gary Madgwick has asked me to point out that The Aviation Workshop has a new email address. Thanks to Yevgeny Borissov, Pawel Okulski, Guy Holroyd, and Skip Robinson.